2011/09/03 Andy Kaiser Comments Off on Welcome to the Future! 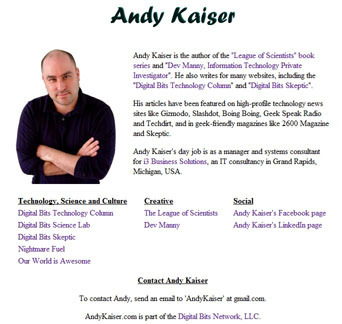 It’s only been a few years, but AndyKaiser.com was looking just a tad dated. Remember the beautiful, hand-crafted old website? I suppose it wasn’t that bad. Simple and minimalist and all that. But I still wanted to change it. Why? So I could do things like this, what I’m doing right now. Post any new thoughts and progress on my various projects. For example, you may be aware of the books I’ve written, Dev Manny and the League of Scientists. However, I’m currently writing another book, of which I’ll tell you more about in another post. And I’d like to share with you as I make progress on it. What should I do, then? Build a new website for it? That’s a lot of work, and I don’t yet know if this book will be standalone or a series. And what about the book after that? What if I start a new unrelated project? In the interests of keeping things simple, I’m making the effort to revamp andykaiser.com into a newer format. That is, a blog, a news site, whatever you want to call it, it’s a way to easily keep track of everything I’m doing, as opposed to following multiple websites (which you’re still welcome to do). If you’re interested in my work, click the “Follow” links above to subscribe via email, RSS or whatever your preference happens to be. I’ll keep you up to date with everything Andy.